If you and the family are planning a camping holiday, you’ll want to make sure you have plenty of space- both for yourselves and all of your equipment. The best 6 person tent will provide all of this as well as a series of features that will ensure you stay comfortable throughout, no matter the weather. 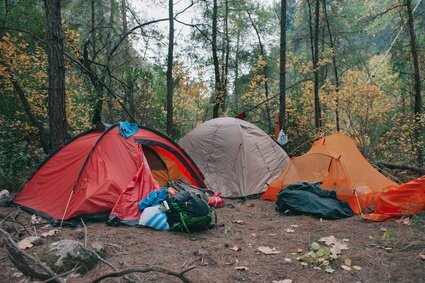 In this article we take a look at the important considerations you need to take before making your purchase, and provide some 6 person tent reviews to help you find the best option for your needs. Tent designs are constantly evolving to provide the features and comfort that modern day camping requires. With such a wide range of products being available, there’s bound to be one that perfectly suits your needs at a reasonable price. Before you buy a multi person tent, though, there are a few factors you will need to consider about how you plan on using your tent, because these will help determine which one is right for you. What is a Six Person Tent? Six person tents will provide either one or two rooms with enough floor space to sleep six people next to each other. They are also a great choice for small families who want to go camping in spacious, comfortable accommodation, and include a series of features to offer privacy and convenience. The two room versions may have a porch, or a separation screen to divide up the space, while the one room versions offer one large space for everything. With a six person tent you will be able to easily accommodate four adults, or two adults and three children, with plenty of room for storage alongside. Choosing the correct tent size is vital to ensuring everyone will be comfortable on your trip. They are available in anything from a small one person version to something as large as a 12-person option, and it’s important to get one that’s big enough, but not too much so. When manufacturers talk about how many people a tent can hold, they are simply referring to sleeping space. To do this they look at the area of the floor, and calculate how many people can fit next to each other in sleeping bags. This does not mean that there will be much space to move about, or for privacy. If your tent is going to be your main accommodation when you are away you will, therefore, need to account for this. A six person tent will offer a great amount of space for 4 adults, or 2 adults and 3 children, with adequate storage room for all of your equipment as well. Buying a tent that is too small will mean that everyone feels cramped and won’t be able to do anything but sleep in there, and buying a tent that is too big risks leaving you with a heavy and bulky object to transport with you, and a more complicated setup. 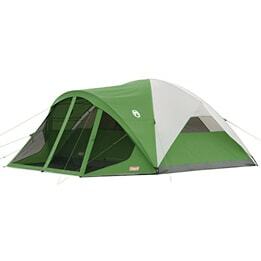 Large Camping Tents are available in lots of different shapes that each have pros and cons. They may come with a porch, separated rooms, tall headroom and the option to customize all of these. Separate rooms are really useful because they provide a much better level of privacy to everyone. If you have children with you, for example, it could be a good idea to give them their own separate space. This increases their sense of independence, and will also allow for different members of the family to go to sleep at different times without interrupting each other. Some tents will separate the rooms with a zipper, and this is ideal for young kids in particular because you will be able to easily access that area in the night if you need to offer reassurance. The place you plan on using your tent will have implications for the type of design you will need. It’s essential that you feel comfortable while you are camping and varying weather conditions will influence this. Some tents, for example, have features to improve ventilation to help you keep cool in warmer temperatures, while others are made from thicker materials to keep you warmer in the cold. Waterproofing is also an important aspect to consider, because different products will offer different safeguards to prevent you from getting wet. For all of the extra space and comfort you get with huge camping tents, there are some downsides. They take up a lot more space, both when packed away and erected, so you need to consider the practicality. Is there enough room in your car to transport it to the campsite alongside all of the other equipment you want to take with you, and will there be enough space at the campsite for you to put it up? Larger tents are also more complicated to set up than three of four person versions because of the multiple rooms, number of poles, and overall rigidity that the structure needs to stay standing tall. Your level of expertise and confidence with this should also be taken into account, because you want the setup process to be as simple as possible. Some tents can be put up relatively quickly, while others can be far more complicated. This is a vital factor to investigate before making a purchase, and you must make sure that the one you get is well within your ability. Different tents will also come with extra features, like storage space, easy-to-use zippers or even an electrical access port that will make things far more convenient when you are using it. 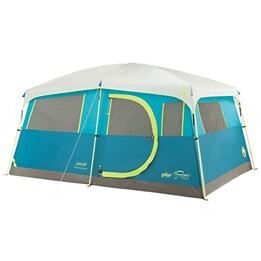 If you’re going camping as part of a group of six people, then this tent from Coleman will provide you with plenty of room for everyone to feel comfortable and have storage space for their belongings. This tent is really good for privacy, too, because you can separate the inside into three different rooms with the included dividers. It’s easy to setup by two people, but you should practice a bit before you try doing it on your own. It’s a large tent, and you get a huge amount of space inside. The center height is six feet, so there will either be enough room for you to stand, or at least enough to give you plenty of space to move around. Coleman have used their WeatherTec system that uses welded floors and inverted seams to keep water from getting in, and the combination of a Cool Air port and adjustable venting system allows you to control the amount of airflow throughout the tent so you remain feeling comfortable. We personally would prefer a rainfly that goes all the way to the ground, but so far we have had no reports of this being an issue in rainy weather. Fingers crossed! People also noted that having the front 'welcome mat' / mud tarp detachable is a winner as you can now remove and clean this outside of the tent. A concern however, ​is that if there are water droplets on the outside of the front door/flap, then when this is opened, the water can fall into the tent. Ideally, an overhang would've been better for this design, but this is just a minor concern for a pretty well-trusted tent brand! 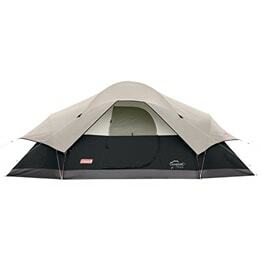 Coleman have designed this tall tent to be the center of activity on the campsite through any weather. It is rated for six people, although is probably more ideal for four or five, and provides two rooms for privacy and storage. The floor space measures at 17 feet x 9 feet, and the center height reaches a massive 6 feet and 10 inches tall, which is plenty of room for most people to stand up straight. The second room doesn’t have a floor, which allows proper draining and works for most people. This room does have meshed surroundings to allow a fresh airflow throughout. It is ideal for meals and gatherings within the tent, and will keep you in the shade from sunny weather, or protect you from the rain. Their comfort system expands on this by including an adjustable vent so you can control the exact airflow that you get. This tent has an electrical access port that can be opened independently to the main door, and allow you to power all of your gadgets. There are also a series of pocket on the interior that allows for easy storage of your gear, and the front door itself is hinged to make for easy access. No more annoying zipping in and out especially when you're carrying something! ​Great tent, but could be a bit larger in space. This tent from Coleman is adaptable to every type of weather, and is ideal for use by larger groups of up to 8, for short or longer term trips. The floor space is 15 feet x 12 feet, and there is 6 feet of headroom at the center to give you plenty of room to move around. If you do fill the tent to its capacity with people, then the access to the door is a bit limited and can be a hassle when you need a 3am pee break! 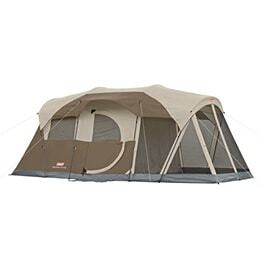 You might also consider a family tent for your family camping trips. The WeatherTec system uses a series of design features to prevent rain from getting inside, and by having 4 large mesh windows and a fully screened porch, airflow is ample and controllable. Many campers report that their Coleman Evanston ​tent holds up very well in bad weather, due to it's sturdy design and quality of materials. You are able to change the design of the tent around a bit depending on the weather. If it’s really hot you can remove some of the canopy to allow more sun and air to enter, but when it’s raining you can cover the whole thing up so you have lots of space to move about in​. The 'porch' area is a nice touch, with many campers making full use of this area, ​though this area may get wet in bad weather as the awning doesn't go completely over it. This cabin design tent from Coleman offers something unique and different to the rest. Despite looking like it will be tricky, this one will only take about ten minutes to set up. If setting up your tent is not something you want to do on your camping trip, there are very easy-to-setup instant tents available. Once you have done, you will have a large area of 13 feet 6 inches x 9 feet, which is plenty of room to six or seven people to comfortably stay. The WeatherTec system uses design features like welded floors and inverted seams to help prevent water from getting inside, and it is 75% more water-resistant to similar tents because of the resistant materials that have been used in its construction. The reflectors on the tent also make finding your tent at night with only a flashlight, a breeze. Very thoughtful feature. The thing that really makes this tent stand out is the closet. It comes with shelves and ​gives 2 feet x 2 feet of dedicated storage space to keep you clothes and gear out of the way without loosing floorspace, while being protected. Very nifty, and practical! Some even used it for their dog beds! Many also like the hinged door which has a pole in it so you can use it like a real door, with a Velco strip. You can of course, still zip it up when need be. The only thing to be careful about this tent is its overall weight. At 41 pounds this is not really practical to take with you on a hike, and you will need to ensure there’s enough room in your car to transport it to a campsite alongside all of the other equipment you will be taking with you. 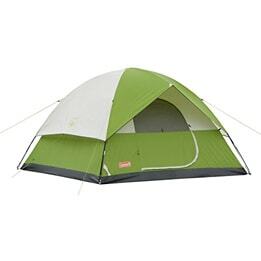 If you are looking for a low priced tent that will sleep four or five people, then this tent from Coleman could be perfect for you. It offers floor space of 10 feet x 10 feet, which will be enough for you to all comfortably fit in, and a height of six feet to allow plenty of room to move about. ​Practicality has been in mind when they were designing this one, with an electrical access port in the side that allows you to run a cable into the tent without needing to leave the door precariously open. The storage pocket is also very handy for storing torchlight, phone etc. The large door makes it simple to get in or out of the tent, and the hooded fly ensures that it is kept well ventilated, even if it is raining. The mesh windows help the airflow even more, and the bathtub style floor protects you from water seeping in. Two of the walls ​are mesh, not fabric, and while​ the fiberglass frame gives resilient strength against windy weather, be mindful of cold or dusty conditions. ​At 16.31 pounds this tent is lightweight, especially for a larger tent, and easy to carry to wherever you want to set it up.​​ It's also a pretty easy design to set up and pack down which is half the battle when camping! Larger tents are suitable for longer stays or for accommodating groups or families, and will provide you with the room to comfortably live in during your trip. If it rains, it is perfectly feasible to remain inside your tent throughout, with the best 6 person tent offering extra features to improve overall comfort and functionality whether the weather!